INFORMATION NIGHT at the Peninsula Theatre: Monday Nov 19, 7 pm. AUDITIONS: Wednesday Nov 21, from 7 pm. No memorised monologues required. Comprehensive audition pages are available to download: we will choose on the night which bits to use. Reading all the pages will give you a very good idea of the play as a whole. A search for nealewenglish.weebly.com/uploads will lead you to a full text. Please email, call or text me on 0432109977, for more information or to register for auditions. 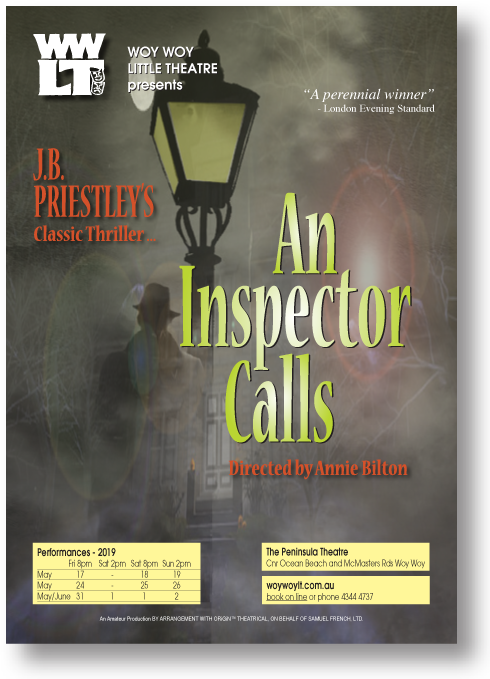 Set in England in 1912, this is a cleverly built tense mystery drama which continues to thrill audiences since it was first staged in 1946. The play opens on a happy family scene: daughter Sheila and Gerald Croft have announced their engagement. Sheila’s parents, Arthur and Sybil Birling, are very pleased: the Crofts are high society and for Arthur, a wealthy but self-made industrialist, this means entree to the closed world of privilege. The young couple - attractive, confident and in love - are equally pleased with themselves. The only jarring note is Sheila’s sardonic younger brother Eric. Then an Inspector arrives. He announces that a young woman who was brought to the Infirmary after swallowing disinfectant, has died. As the Inspector interrogates each family member one after the other to find out if they knew the woman, social niceties are stripped away to reveal ugly truths about each character’s role in the woman’s descent to suicide. Sheila breaks her engagement, and the whole family faces social disgrace. The end is one of the most powerful and chilling finishes in English theatre. Who - or what - was this Inspector and what now does this family face? The play is rich in subtext and implications about the coming war, about social justice and responsibility to others - Priestley’s themes in most of his work. But these themes are never at the forefront but there to be teased out through this most brilliant of classic dramas. A solid man but not pretentious, Arthur is a wealthy manufacturer. He has risen from humble beginnings and is very satisfied with what he has achieved. He is respected in his circles and content in his family life, but as an employer he is ruthless: profit above any consideration of worker welfare. Sybil “married down” to get a wealthy husband, and is very much aware of her superior social status. She appears cold and arrogant, but clearly does care for her children - in theory at least. Pretty and privileged through money, Sheila seems to lead a charmed life. But her vanity is her undoing, jealousy and pique unleashing in her a carelessly cruel streak. However she is honest, prepared to face and accept guilt. Eric, sulky and sardonic on the surface, leads a secret life about which his parents know nothing. He is an uncomfortable mix of shyness and assertiveness - and he is a secret drinker. A personable, charming young man-about-town. Honestly cares for Sheila and when the facts are revealed, honestly faces up to the role he played in the tragedy. Yet when the possibility of escaping unscathed is presented, he reverts to social type in an attempt to cover up. The maid. A small role with few lines - but as the author points out, she is the only character who shares the dead woman’s working class status. So there is room here for her reaction to what is happening when she is on stage.